I’m a little late and a dollar short on my look back at 2010, and as I once again look ahead to a busy first few months of the new year (‘day job’ teaching, and of course a lot of knitting plans), I’m glad to have taken it a bit slow for these first few days of the new year. It has been restful to allow myself a bit of time to work on my current projects and think about new ones, without interruption. I’ve also been wearing my last big project of 2010, and grabbed some photos of it yesterday thanks to Bridget, which means I can finally report on it here and call 2010 officially wrapped up. This is my fair isle yoke cardigan, worked from instructions found in Elizabeth Zimmerman’s Knitting Around. It is based on her ‘percentage system’, instructing you to do the math for your own body and essentially design your own sweater to fit. As written, the pattern instructions are for a pullover, but I decided to plan it out as a cardigan using a steek down the centre to create the gap for the button band (as described in my previous post). I’m happy with how it turned out, though I do wish in retrospect that I had used just one more button, allowing for slightly closer distance between buttons. It was an enjoyable knit, and one which really progressed fairly quickly once I dedicated myself to it (it was sadly put aside more than once, for a couple of weeks at a time), since the majority of it is plain stockinette stitch. And because I’m Like That, I decided to choose my own fair isle motifs for the yoke (and sleeve accents, for fun), which took a bit more brain time for decision-making but again moved pretty quickly once I sat down to do it. I’m happy with the final result and would be happy to knit another one – perhaps even take the foundational ideas into some designs. My 2010 had some good knitting in it. All in all in 2010, I completed 30 projects or so – a great number, but one which is actually smaller than my totals for any of the years past. I think this is because I devoted more of my time than ever before to projects of my own design, and with design comes time spent in progress and thought before anything can be completed. I’m happy with the projects I did this year – 5 sweaters, 11 pairs of socks, 6 pairs of mittens and gloves, and many other shawls, hats, and other accessories. I completed many projects that I’m quite proud of, and I’m glad for the things I’ve learned through them. I tried my hand at shawl design for the first time (and then a second time), and have been lucky to have worked with different and beautiful yarns from several Canadian dyers. I travelled to Rhinebeck once again and met up with a lot of wonderful knitting friends, new and old. I expanded by knowledge by taking more knitting classes, and taught a few more knitting classes myself. I look forward to more of all of this in 2011. I hope your 2011 has gotten off to a good start! Happy knitting, and happy weekend ahead. Must. Know. what shoes those are. I’m going to bet those shoes are Clarks! They are darling, especially with those socks. Your knitting is so beautiful. I enjoyed your blog as a newcomer this year and will be following you in 2011. Thank you for sharing! They are indeed Clarks! Helping me model my ‘Neptune High’ socks from last winter. I bought the shoes a couple of years ago, and sadly have no idea if they’re still around in shops. Of course they are Clarks. Thank goodness they’re probably not around in shops any longer, as I already have my eye on a pair of Clarks. Can’t have too many pairs of shoes as I need the room and the money for yarn. The sweater looks very beautiful and you look rocking in it. 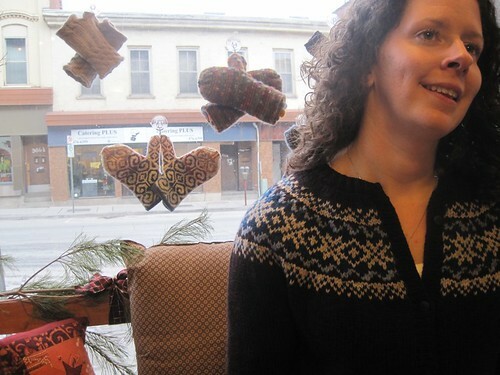 A Fair Isle yoked cardi is at the top of my 2011 list. Yours is stunning and just the inspirational push I need. All the best to you in the New Year! I love this cardigan! I agree with you about the buttons but as long as you wear it! I’m jealous because I haven’t had the courage or the time to try steeks. Yours is lovely and inspiring! That cardigan is so beautiful! 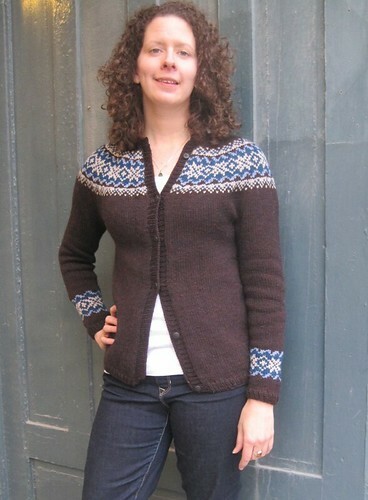 I am glad to see the finished photos of your cardigan, I really enjoyed your post on steeks. One of these days, I’m going to steek something. Someday. I love the socks! That project is on my agenda this year. Awesome – that is true inspiration! I, too, ended the year on a fair isle, in this case a pullover (Plum Frost cardigan/pullover by Elinor Brown) for my daughter. I’m intrigued by what you said about Elizabeth Zimmerman’s technique for designing your own, I might just have to try that! Love the cardigan! It’s just beautiful, and it’s going to be so versatile.. Brown and blue is one of my favorite color combinations. 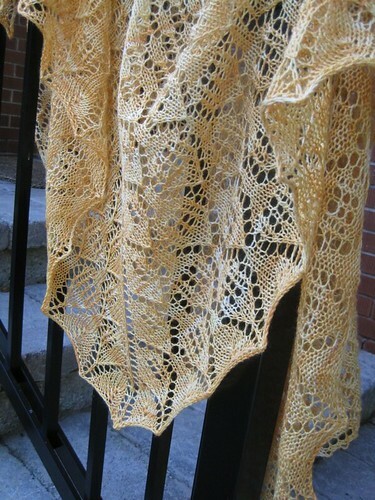 I love your projects, you knit so well and beautifully, I am just starting to knit even though I learned long time ago. I am also a teacher. I love your blog and will come here more often to check the great ideas and hints you give, thank you!! 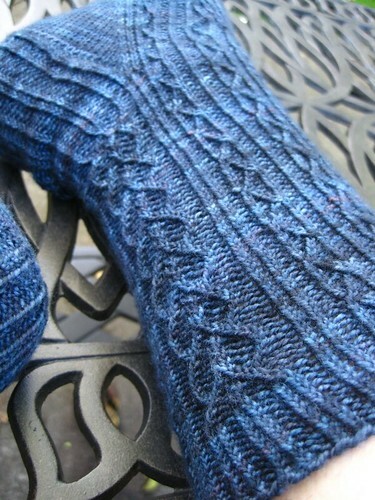 I especially like the socks, I am a sock knitting fanatic but I can’t seem to finish my first pair! The sweater is fabulous. love the restrained colors and, like the others, I also love the socks and SHOES! I am new to sock knitting and am looking for shoes to model results! Am amazed at your output for 2010 and will be following you in the new year!